How to get there: This mountain is located on the island Seiland, a large island with a small population near its south and north end. Most of the island became a national park in 2006. A good starting point is the town Alta with (fairly) frequent flights to Oslo. From the center of Alta, drive Hwy. E-6 north (direction Kirkenes) 29 kilometer, then go left on Hwy. 883 (sign for Lerresfjord). Another 29 kilometer on this highway will get you to Storekorsnes where there is a boat connection to Hakkstabben on Seiland. Storekorsnes is located at N70:12.865, E023:11.533. Check the ferry and boat routes for the schedule, typically, there is one departure every day. If you arrive by car, then park at Storekorsnes. One may also go by boat all the way from Alta. From Hakkstabben (location N70:16.705, E023:07.257), there is about 7 kilometer road to Hammelnes further north. One may also get off the boat at Altneset, about 2 kilometer from Hammelnes. 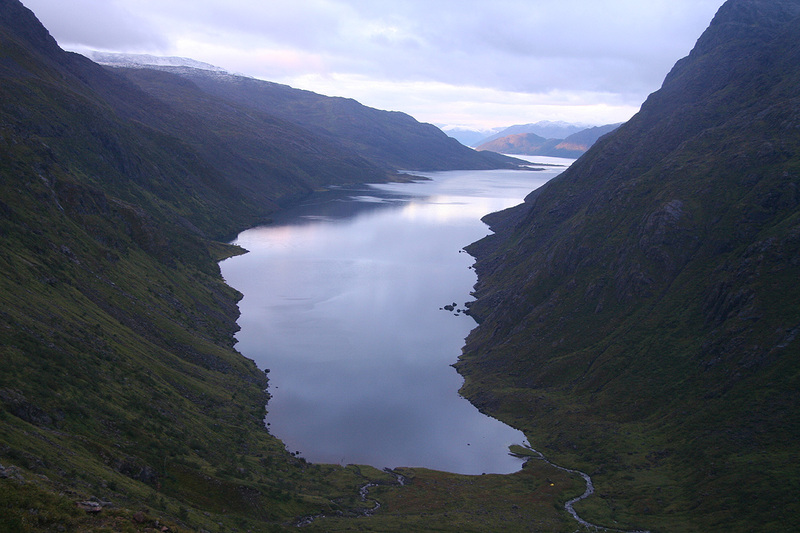 From here, one can hike along the east side of Store Kufjorden to Kufjordbotn, a distance of about 10 kilometer. 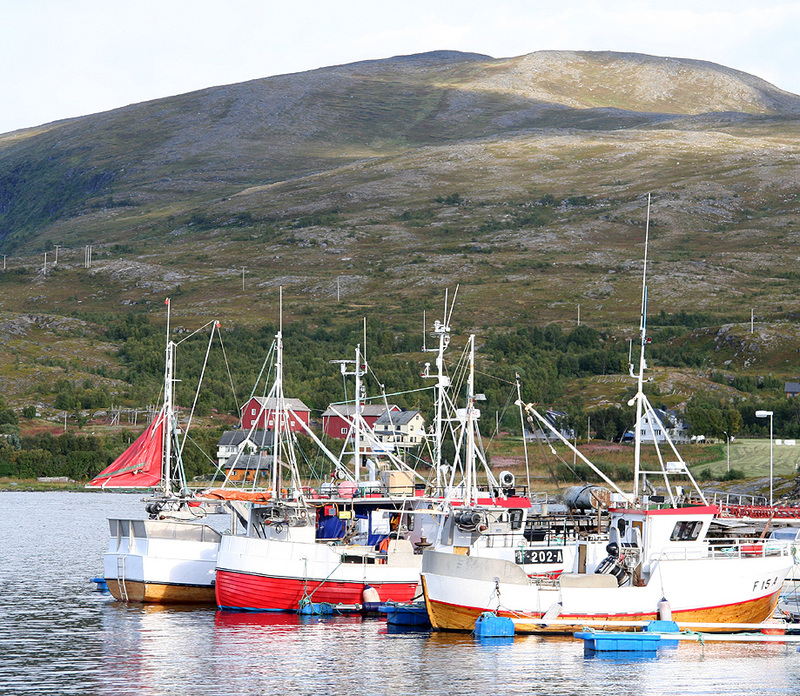 A somewhat better alternative is to find local boat transport from here to Kufjordbotn. This should be arranged/agreed in advance. 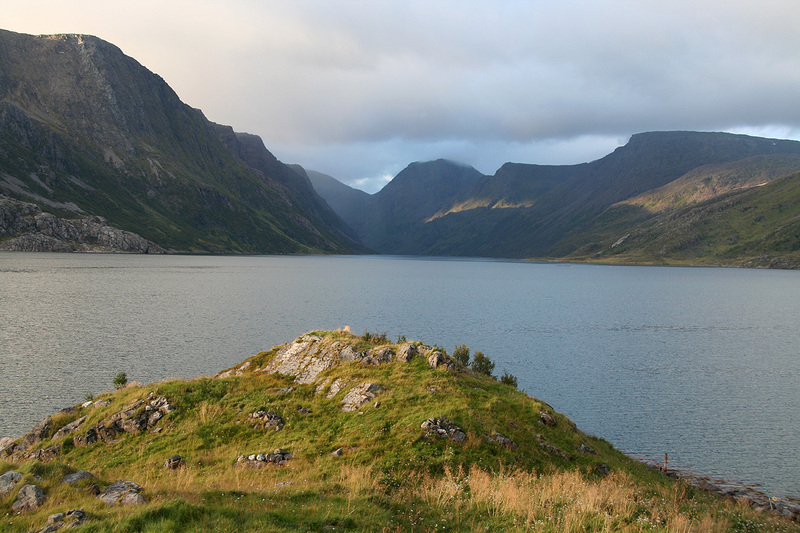 Kufjordbotn is a very beautiful spot with green mountain slopes on three sides. Establish your camp here, location N70:24.527, E023:07.006. 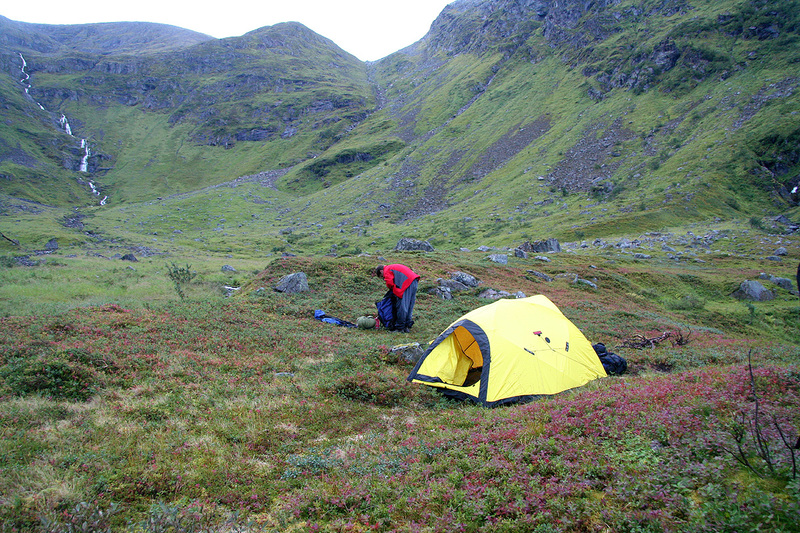 This is a good base camp from which one can climb Seilandstuva and Seilandsjøkulen, the highest points on the west and east part of the island respectively. 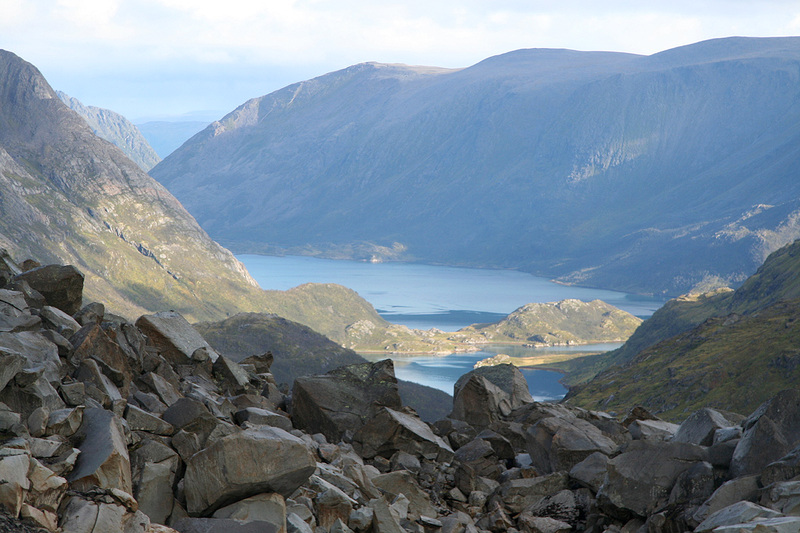 Route description: From Kufjordbotn, head directly up the broad gully leading to the col Straumskardet. Standing with your back towards the fjord, you will see a creek coming down from a lake higher up, there is also a creek coming down on your right hand side. The correct gully is between these two, it also has a creek, but this one is smaller. The route is indicated here. It is quite easy terrain, but definitely uphill. Climb the grass field on the right hand side first, then cross the creek before such a crossing becomes more cumbersome. Complete the ascent along the left side of the gully. Higher up, the slope becomes less steep as you arrive at the col called Straumskardet. 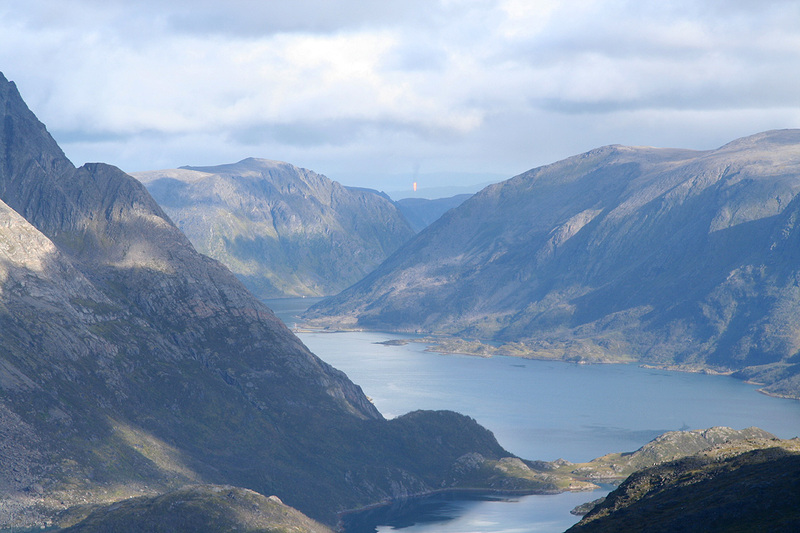 From here, you have a view further north through Straumdalen to Jøfjorden. Turn left and continue the ascent along nice terrain. Again, the slope decreases higher up as you may find patches of permanent snow. A rather small glacier is located on your right. Continue uphill as you make a traversing climb on the slope that generally comes down on your right (north) side. This route will gain a couple of false summits, however the dips between them are rather small and overall this route seems preferable. As you gain point 1048, the remaining trip is generally flat, first a small descent, then a very gradual ascent to the final, broad ridge that leads to the Seiland Island High Point. There is a good sized cairn marking the location. 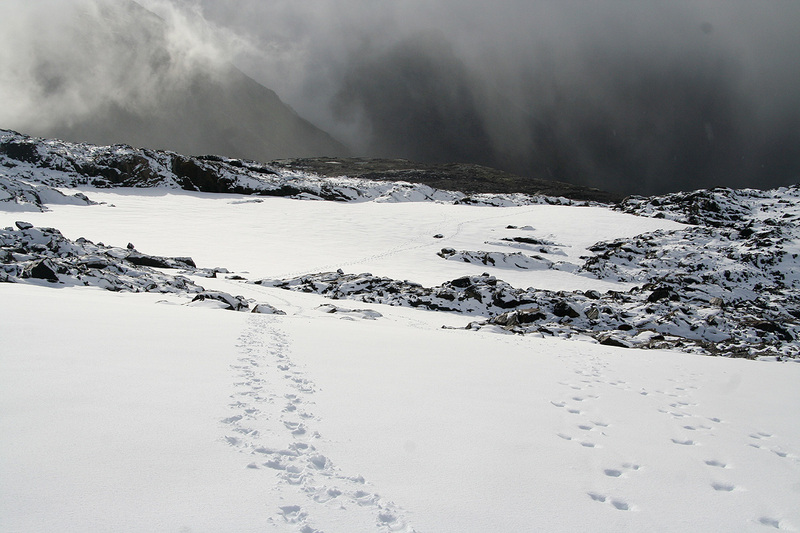 It should be noted that there is no need to cross any glacier on this route. Descend the same way. One can extend this trip by hiking onwards to Seilandsjøkulen directly from Straumskardet. See this description under that mountain. Comments: Seilandstuva is the northernmost mountain in Scandinavia with more than 1000 meter of prominence. See also the report by Geir Åke. 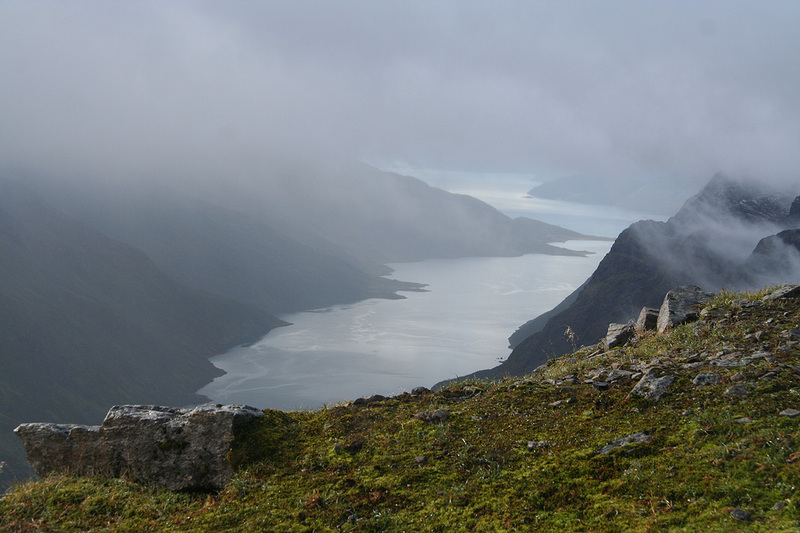 The previous day, I had climbed Store Haldi, the third highest mountain in Finnmark. I had a quiet morning waiting for the arrival of my friend Geir Åke Dahlen. He arrived on time from Oslo around 1415. After some shopping, we drove to Storekorsnes. From here, we got the first panorama view across to Seiland. We then located Storekorsnes pier, parked and took the boat to Hakkstabben at 1730. This boat cost NOK 42 per person (2007). At Hakkstabben, we were met by Knut, a Seiland inhabitant who had kindly agreed to provide us with boat transportation. Knut told us about Seiland, showed us the rock "Hakkstabben", from which the place had been named. The postal service needed an unusual name to differentiate from other places with similar names, thus somebody came up with Hakkstabben. He further told us about all the different minerals that could be found on Seiland, extensive collections of rock specimens exists that have been based on collection from this area. We drove to the other end of the local (7km) road and then travelled with his boat to Kufjordbotn, arriving there around 1930. We said goodbye and agreed that he (or his son) should return the next day at 1900 in order to pick us up. We established camp in an excellent location with fabulous views all around. The somewhat dry creek in this picture shows the first part of our route the next day. What an ideal place for a tent! Knowing that the next day would be a long one, we went early to sleep. The alarm went off at 0400, breakfast quickly followed and we were on our way by 0500. The grassy slopes were steep, but nice to hike. We quickly gained elevation as we climbed the slope leading up to Straumskardet. 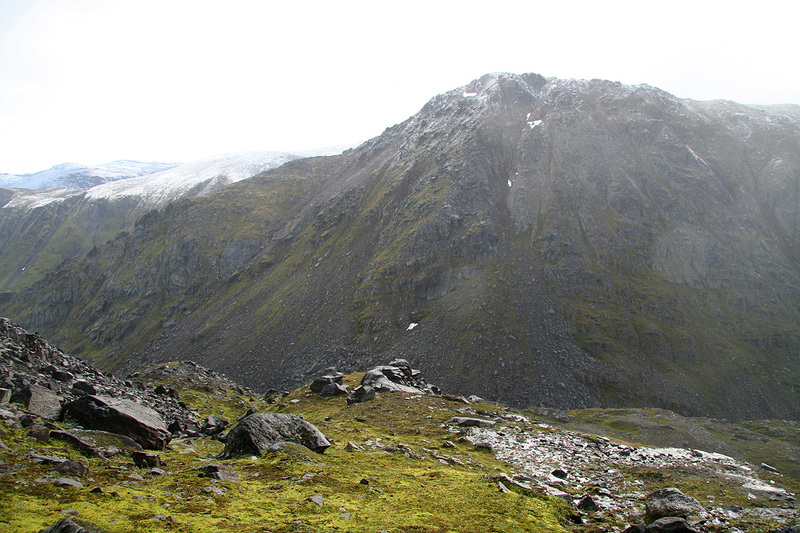 We were there at 0615 and eagerly looked up the slope north of Gáhpu, our plan depended on being able to climb it after returning from Seilandstuva. The weather was foggy and we did not reach any definite conclusion, but I believed strongly that the route "would go" without big problems. We headed up the slopes towards Seilandstuva in mixed weather, we had a few short breaks with sun, but also flurries of snow. Higher up, there were patches of snow that facilitated hiking and we soon gained the 1048 summit. More fog closed in and the wind picked up, making our arrival at the Seiland high point quite a cold experience. More clothes had to come on and the summit stay was limited to about 10 minutes. It had taken us precisely 3 hours to climb this peak from our camp by the fjord. The glacier, Normannsjøkelen, that is very prominent on many maps, was not very visible. 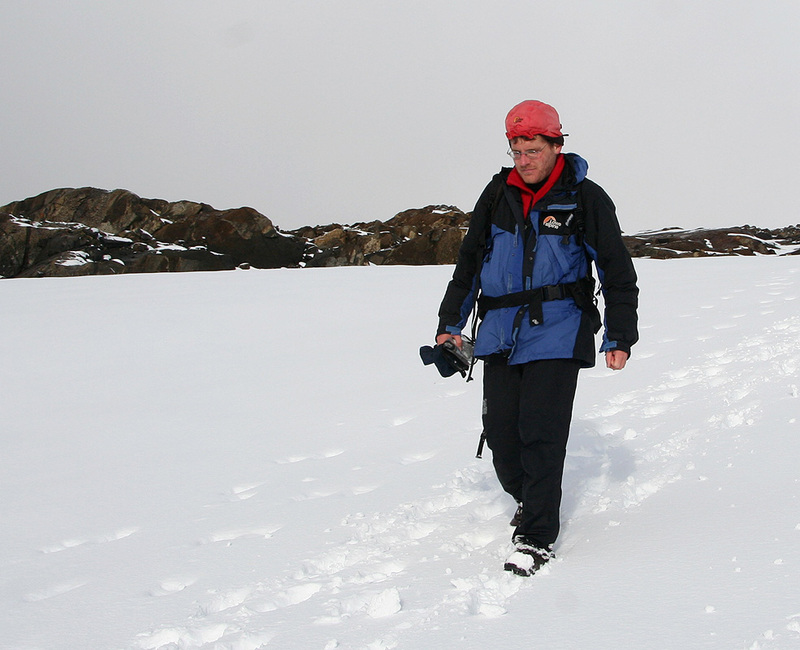 There is a small glacier falling down towards Straumskadet, just north of our ascent route, then the main part of the glacier should be north of the summit, however, with limited visibility we could not see it. 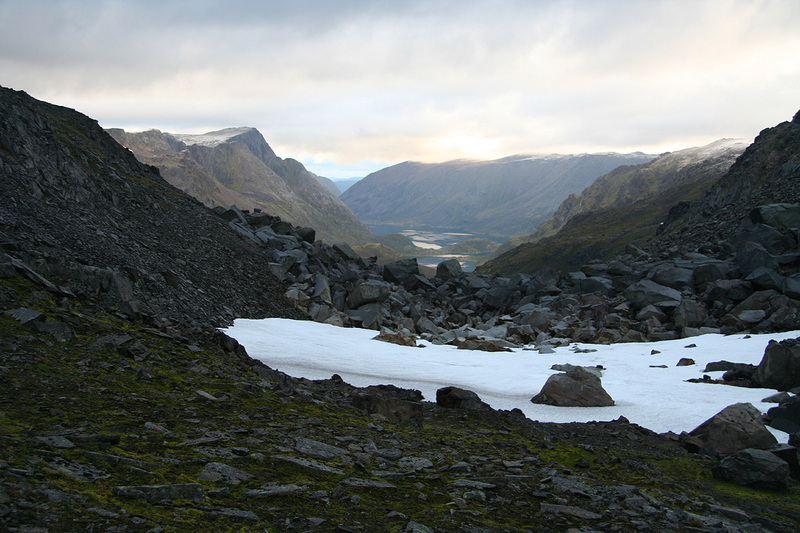 It seems that our climate change is having a big effect on this northernmost glacier in Scandinavia. Our ambitious plan called for visiting the highest point on the east part of the island as well. This peak is similarly the highest point near the glacier that covers most of the highest land there. 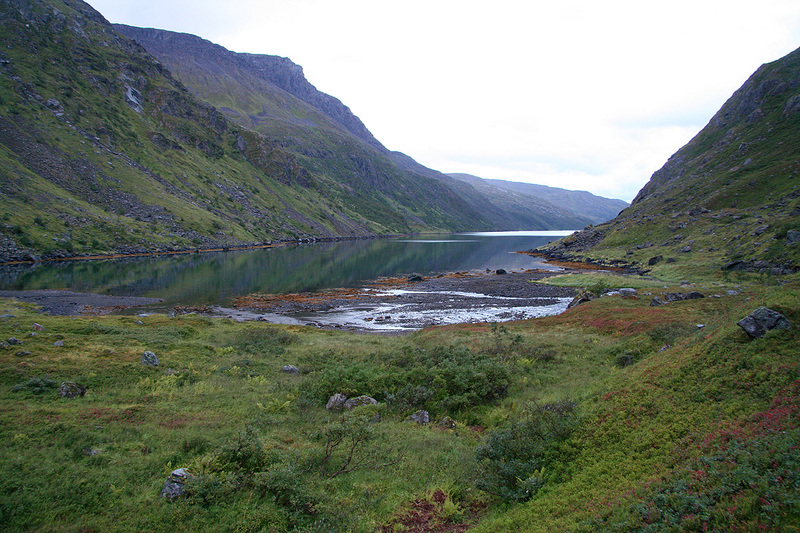 We descended back towards Straumskardet as the weather improved and the sun came back out. From Straumskardet we now had a better view north, we could even see the gas burning flame from the Snøhvit gas field (LNG based) that is about to enter production. This trip report is therefore continued under the Seilandsjøkelen report. 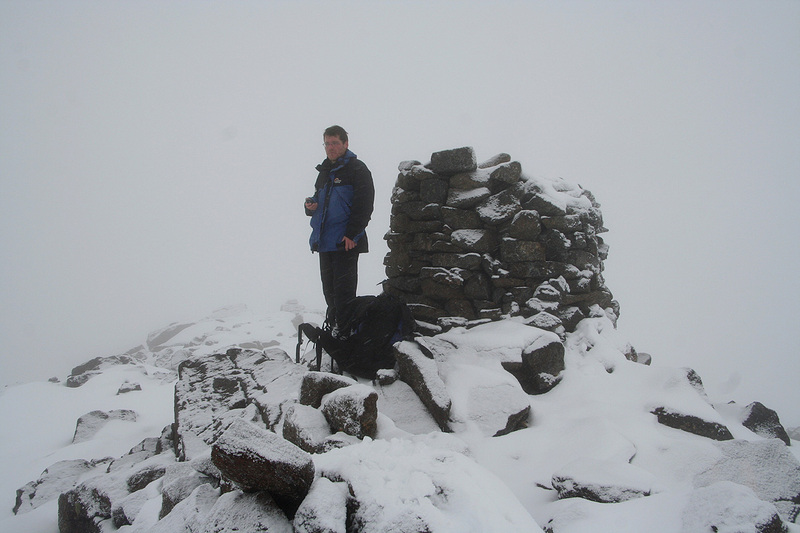 Geir Åke and the summit cairn. Descending from Seilandstuva. The weather created interesting lights and colors. 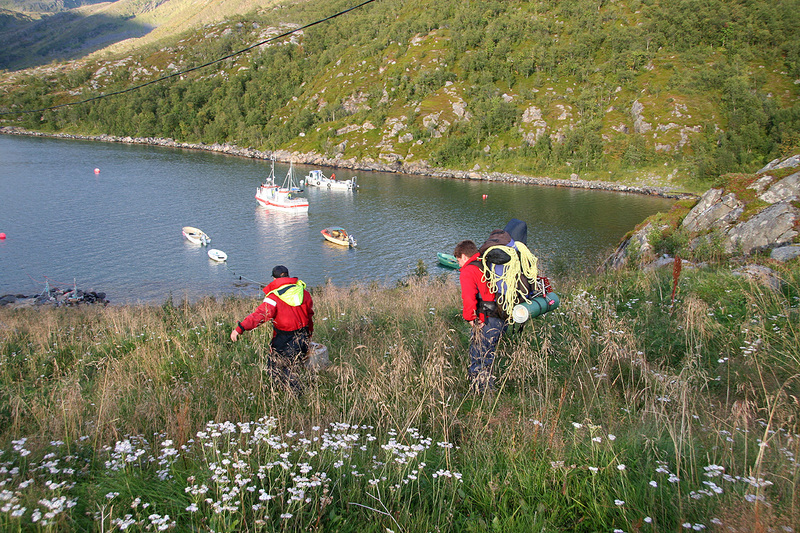 Descending from Seilandstuva. View down to and out Kufjorden.